“Kids would ask me for my autograph” – RIASA student-athlete debuts for Cork City F.C. McFarlane is amongst a number of student-athletes to have pro club experience this year. In 2018, a handful of RIASA student-athletes have been offered the opportunity to train and play with a number of pro clubs, including Birmingham, Oldham and now, Cork City F.C. RIASA student-athlete and Lancashire West league winner, Paul McFarlane, recently had the incredible opportunity to play for League of Ireland Premier Division side, Cork City F.C. McFarlane featured as part of the first team squad in a pre-season friendly against Premier League side, Burnley F.C. Unfortunately, Burnley got the win with only 1 goal separating the sides. Nonetheless, it was a great experience for McFarlane and we caught up with him to find out more about his week with a professional club. So, you spent the entire week with Cork City F.C., could you tell us what you got up too? I flew into Belfast on Sunday 8 July and spent the night there, then I traveled down to Cork on Monday morning. I took the time on Monday to explore a bit. I really liked the compactness of the city. Everything is within walking distance and easily accessible. The next day I watched the Champions League fixture between Cork City FC and Legia Warsaw. The atmosphere in the stadium was great. It was unfortunate that Cork lost the game but it was a good performance nevertheless. On Wednesday, I had my first training session in the morning with the Reserve squad. The following day I trained with the U19 squad since the first team did not have training. Finally, on Friday I played in a match against Burnley FC before traveling back home the next day. How were the facilities in Cork? Did you enjoy training and playing in the pro environment? Cork had good facilities available for the players. The staff, as well as the players, were very friendly. I really enjoyed being in a professional environment. They play and train at a high intensity. You have to be willing to work at 100% every single day. Did you have any notable interactions with any of the pros or coaching staff? After the game against Burnley, I went out for dinner with a couple of the players. I enjoyed interacting with them. They treated me well while I was there. We spoke about their experiences at the club as well as the game that night. You played the final portion of the game against Burnley, could you tell me about that? In the game against Burnley, I played the last 15 minutes. I never played in front of a crowd of that magnitude before, so that was a new experience for me. Knowing the quality of the opposition, I knew it would be a difficult game. Pre-match I didn’t experience any nerves. I was more anxious to get onto the field and perform to the best of my abilities. While warming up and during halftime of the game, kids would ask me for my autograph as well as for me to take pictures with them, but I tried to stay focused. When I got into the game the speed of play was quick, but I believe that I can play at that level. D0 you feel like you were prepared you well for making the transition to the pro environment? 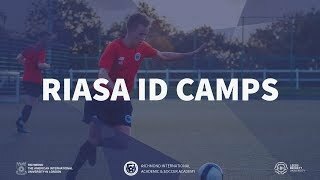 I definitely feel as if RIASA has allowed me to improve and develop as a player. Especially last season, the professional mentality implemented into the program has had a major impact on the way in which I approach my game. I would have hoped to have gone straight into the trial directly after my last season rather than in the middle of preseason so that I could be at my optimal level; however, I was fortunate for the opportunity. The next step for me is to get back to RIASA and continue working hard in order to transition to professional football. I plan on making the most of my next opportunity when it comes.